Forget Old Spice. Disregard Dos Equis. Give up on Gorton's. 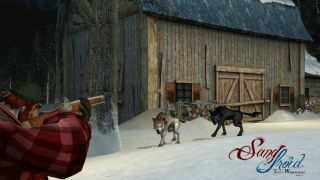 Indie gaming's got the biggest boost to your manliness, and it's called Sang-Froid: Tales of Werewolves . In development by Artifice Studio, Sang-Froid combines action, strategy, fear, Satan, and the biggest plaid attack since a Brawny clearance sale. Sang-Froid's Greenlight entry holds all the details, but the gist is: two lumberjack brothers set aside their differences to rescue their sister from the maw of demonic forest predators. Apart from a wonderfully vibrant art direction and tower defense tropes demonstrated in Artifice's lengthy gameplay video, Sang-Froid underscores the man-versus-beast mentality of seasoned outdoorsmen with its Fear Factor feature, which tips the odds in your favor as you intimidate wolfish foes with fire, scent, and traps. The characters are already named, but if naming were allowed -- granted I don't suffer from Naming Paralysis - you can bet all the wolf pelts in the world my character's name will be Liam Neeson.